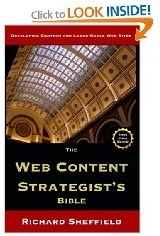 Found your blog on http://www.blogs.com/topten/top-10-content-filled-content-strategy-blogs/ while doing research on some content strategies. I'm impressed with what I'm seeing here. Hopefully I'll be able to put some of our tips to work. I agree, absolutely. When working with clients on content, my first question is always, "What is the purpose of this page?" That purpose may be very clear and immediate, like "Get them to subscribe." Or it might serve a slightly less concrete purpose, like, "Engage the readers and make them want to come back, or share this page with others." But one way or another, every page needs a purpose or a goal. An excellent guiding principle Richard. I'm certain I'm not the only one to think that either...I received this link from a double-retweet. I blogged on the same topic (with a link back here) too.